The exhibition will remain until November 28. Join us as we dive into a red world. Tonight we’ll explore just what it means to BLEED. What does blood mean to you? Are you afraid of it? Do you worship it? Or is it just the color that attracts you? 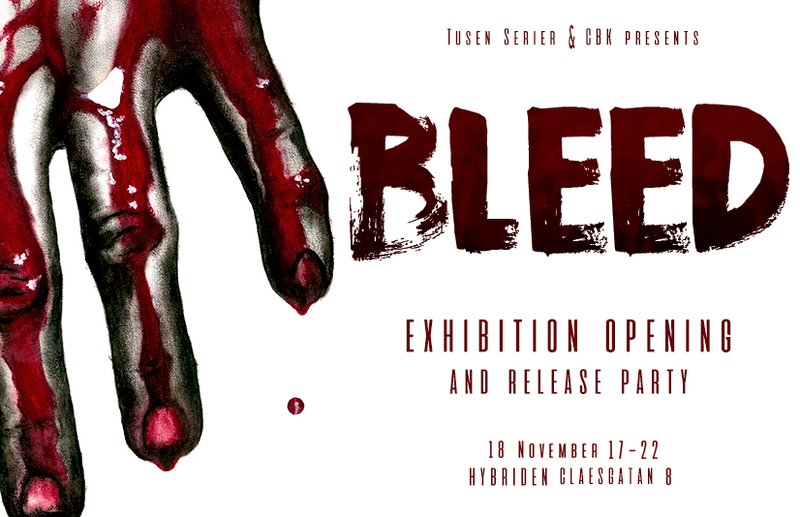 At Hybriden you will see artists draw blood and see their visual interpretations of the theme. It will indeed be a red experience. We will overwhelm your senses! Not just by the artwork itself, but the music will be tailored for this night. The wine will be blessed and prepared. Amongst all of this we will have a blood fountain. The exhibition is accompanied by CBA vol 35: BLEED that includes a wide array of comics on the same theme. This exhibition is a cooperation between Tusen Serier and CBK, with support from Malmö Kulturstöd.